Mama Gump says that,” Life is like a box of chocolates; you never know what you’re gonna get.” As I cleaned my house this weekend (it was still looking like Hoarders – Pre-K), I came to think that perhaps life is also like the monkey bars. 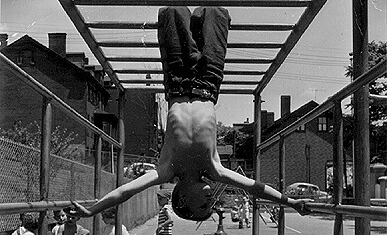 We had a set of those old, straight monkey bars on the playground at St. Francis when I was a kid. I was chubby, slow, awkward and fearful. I was afraid to play on them for fear that I would get hurt, that someone would laugh or look up my skirt. When I finally did try crossing them, I did it slowly, moving one rung at a time. No so my friend Kelly. She was fearless! She swung across them gracefully, skipping rungs as she used her momentum to propel her from one side to the other. Shorts beneath her uniform, she would hang upside down, wringing every ounce of joy from the experience as she was suspended there. On the 12th, I talked about conflicts that eventually claim those who originally claimed them. The same thing is true with anything, don’t you think? We claim a job, a possession, a relationship; but, those things often end up claiming and owning us. A job becomes who I am, not what I do. I insure and guard my possessions. Friendships and romantic relationships can easily become an end in themselves. We end up possessed by things we once called our own. As I sifted through the flotsam of my life this weekend, I saw it in technicolor. So how do we know when we need to let go of those things? If I had the answer to that, you’d be reading it in my bestselling book or watching me talk about it on reruns of my talk show (I’d be hiking in Scotland somewhere, natch). Here’s what I do know: when I feel myself becoming someone I don’t like, it’s time to take a hard look. I’ve had jobs where I felt taken advantage of, taken for granted, underpaid, underappreciated. I became angry stayed that way. I’ve had possessions that made me feel weighted down and panicked over how to protect them. I’ve had friendships and romantic relationships in which I have felt uneasy, unsure, undervalued and overvalued. In all of those cases, I became anxious. I choose not to live an angry life; so, I had to leave those jobs. Katrina cleaned me out on the possessions once. I’m trying to figure out how to do it voluntarily right this very minute. And I would love to say that I was strong enough to have ended all of those bad relationships myself; however, that would be a big, fat lie. In all of those instances, the change was painful; however, to preserve or become the person I want to be, I had to make them or accept the ones others made. That’s my key – knowing who it is (or isn’t) that I want to be. As we move through situations that require changes, here’s to knowing when to let go of the last rung and to moving through the rungs fluidly and joyfully.